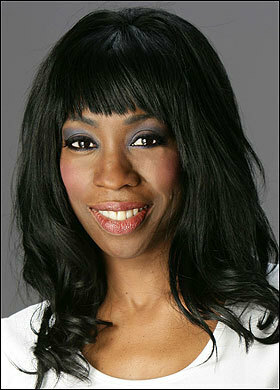 "Small tips make a big difference"
Glamorous singer Heather Small has been dazzling us all on this year’s Strictly Come Dancing TV contest. The M People star’s busy training schedule keeps her dancing most days for the hit BBC show, but we managed to grab some time with her to talk about what’s in her make-up bag. Here she shares her beauty secrets and gives tips on looking amazing — even when you are feeling exhausted. What is your favourite make-up item? I love MAC’s Studio Fix Foundation (19, for stockists call 08700 342676) because it is light on the face and can last all day. What is your favourite skincare treat? The Body Shop’s Olive Body Butter is fantastic (12.50). It is luxurious but inexpensive and proves you do not have to spend a lot of money to get good quality. What is your favourite hair item? Oh, definitely my GHD stylers because they are quick and efficient and work a treat (119, for stockists call 0845 3301133 or go to ghdhair.com). What is your can’t-live-without product? It has to be my MAC fake lashes (7, for stockists call 08700 342676) and my Rimmel Exaggerate black liquid eyeliner (4.88, available nationwide). Anyone who knows me knows I don’t move without these. I don’t even go to the supermarket without them. Famous by Sue Moxley eyeshadow in Marilyn Mauve (9, available at Superdrug). I was stuck one day and had to pick up something quick and I was pleased with how effective it was. Can you give our readers a great beauty tip? Old-fashioned steaming your face over a basin of hot water. It’s particularly good for sensitive skins as it opens up your pores and you can then clean your skin thoroughly with cotton wool, leaving it feeling really soft. What is your favourite salon treatment? Reflexology. I find it hard to relax and this is one treatment where I can fall asleep for an hour and shut everything out. Stella McCartney. It’s a beautiful fragrance and I always feel special when I wear it (36.99, from The Perfume Shop store nationwide or go to theperfumeshop.com). I usually go to the gym but for the last few months it’s been three to four hours of dancing every day that is keeping me trim.